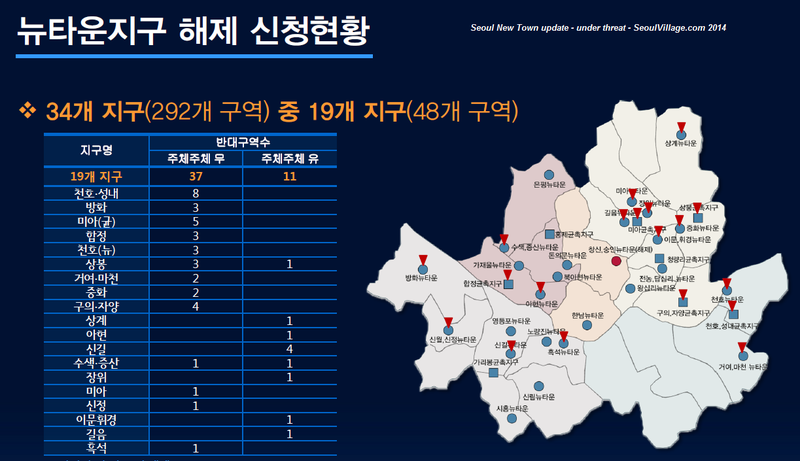 Seoul updated its New Town and Redevelopment Plan after two years of probation*. Citizens are still being surveyed and their comments collected to facilitate key decisions: go/no go, and the allocation of resources and support (including in case of cancellation). The whole process is being monitored and doubled with conflict management teams to prevent the usual bubbles and rumor mill frenzies, but also to learn from best and worst practices. For the cases without promotion, 266 of 286 surveys have been completed, and the rest shall be done by the end of June 2014. No big surprises here. As I explained in "Inhuman, all too human Seoul", the New Town model belongs to the past, and it lost momentum in the Capital even before PARK Won-soon claimed City Hall. His bottom-up, collaborative approach was the only way of defusing potential outcries in a city where real estate speculation remains pervasive. New Towns are not dead yet, and among the projects that will go on, some are already well "advanced", Buk-Ahyeon New Town much more than Donuimun New Town (a.k.a. Gyonam New Town). And they're only part of Seoul's urban planning problems. PS: Michael, don't rejoice too soon: the potential end of Ahyeon New Town wouldn't necessarily mean the survival of your old hanok.